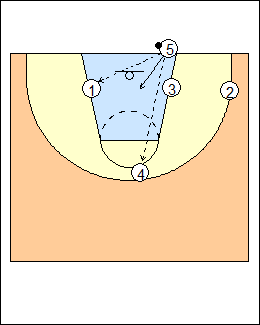 A simple play against man-to-man or zone defence. The inbounder should be a taller player who can pass, 3 should be able to finish near the basket. 2 clears to the corner, 1 cuts to the left block area, 3 cuts down the middle of the lane, 4 floats toward the foul line, then drifts towards halfcourt as a safety valve. (Variation - 1 cuts left or right, 2 goes opposite). On an inbounds pass to 1 or 4, 5 steps in looking for an immediate return pass. 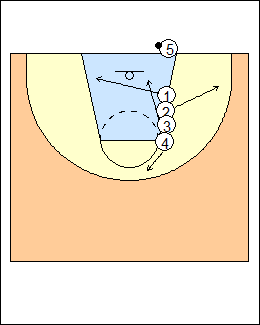 See Inbounds - Baseline Stack 3, Stack, Line.